Lynda Sue Herman, 49, of Bryan, OH, died Saturday morning, January 13, 2018, at CHP Inpatient Hospice in Defiance, the result of various health complications. Born April 10, 1968, in Wauseon, she was the daughter of Cheryl (Daso) and Donald Bird Jr. Lynda was a 1986 graduate of Hilltop Schools and earned Associate Degrees from Northwest State Community College and Defiance College. Lynda lived life to the fullest, and despite losing her sight at the young age of 23, she still was proud of her independence and enjoyed various activities, including cooking and making blankets for family and friends. She was a huge fan of the Pittsburgh Steelers and Ohio State Buckeyes, and she relished the accomplishments of her beloved nieces and nephews. Lynda was a member of the Wesley United Methodist Church in Bryan where she once served as secretary. She was a longtime member of the Bryan Lions Club, currently serving as its president, and was awarded the Melvin Jones Fellow Award, that is presented for dedicated humanitarian services by the organization. 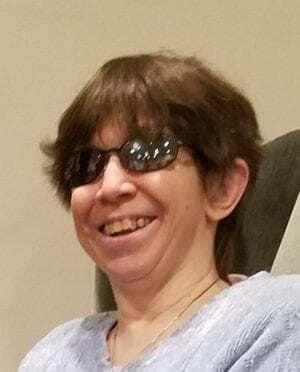 It was through the Lions Club that she was able to obtain her seeing-eye dogs from the Pilot Dog Association in Columbus, and she was active with its alumni program. Surviving are her beloved seeing-eye dog companion, Marleigh Elizabeth; her mother, Cheryl (Dean) Wyse of Maricopa, AZ; her father, Donald (Diane) Bird of Fayette; siblings, Monica (Ray) Smith of West Unity, Cherolyn (Scott) Appleby of Tucson, AZ, Stacey (Jeremy) Dennison of Fayette, Don Bird of Fayette, and Kelly (Michael) Routhier of West Unity; her nieces and nephews, Justin, Jacque, Zachary, and Katelynn Smith, Ashleigh and Makenzee Appleby, Shenae (Chris) Kramer, Kylie Dennison, Layton Bird, and Madeleine and Benjamin Routhier; a great-nephew, Grayson Smith; and numerous aunts, uncles, and extended family. She was preceded in death by a seeing-eye dog, Phoebe; step-father, Danny Thompson; maternal grandparents, Mildred and Carlton Daso; and her paternal grandparents, Donald and Ann Bird. A funeral service for Lynda will be held Wednesday, January 17, 2018, at 11:00 a.m. at the Eagle Funeral Home in Fayette with Pastor Peter Paige officiating. Burial will follow in Pleasant View Union Cemetery in Fayette. The family will receive friends for a visitation on Tuesday from 2-7 p.m.
Memorial contributions in honor of Lynda can be given to CHP Hospice or the Bryan Lions Club. Friends can share memories and words of comfort with the family online at www.eaglefuneralhomes.com. 4 Comments on "Lynda Sue Herman (1968 – 2018)"
Lynda and I were classmates in college at both NWS and Defiance. She was one of the few Social work students I befriended. I loved her zest for life and determination to succeed. I am so sorry for your loss. She will be missed by many. This saddens my heart to hear this Cheryl ! Saying for all of you to heal your breaking hearts from your loss ! Sorry to hear of Lyndas passing. I got to meet her on the weekly trips to Walmart with Mr. Miller. Very nice lady.